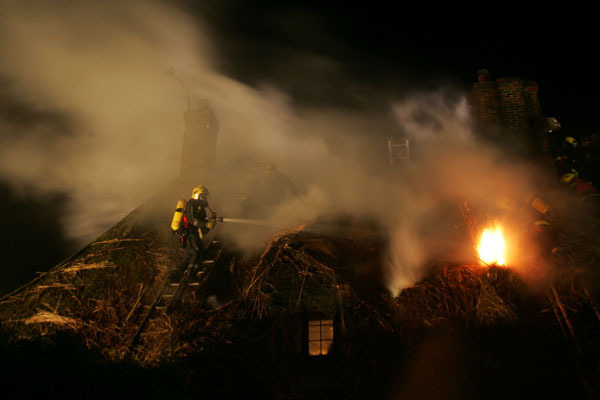 In January 2009, the thatch at Brook Cottages caught fire. A large contingent of fire engines and appliances arrived promptly and although the two cottages were badly damaged, the adjacent Hockley Cottage was preserved. Brook Cottages were fully restored. On Good Friday 2013, the thatch of Brook Cottages once again caught fire. This time, all three cottages were completely destroyed. For a full account of the 2013 fire, on the East Meon History website, click here. Brook and Hockley Cottages fire, 2013. The fire.